Telecommunications giant Verizon Communications Inc. has leased 110,000 square feet of space at the recently renovated Enclave Sorrento office campus in Sorrento Mesa, according to brokerage company JLL. Building owners said Verizon will be consolidating more than 600 employees from three other current office locations in San Diego, as it moves into the campus at 9808 and 9868 Scranton Road. Officials did not disclose financial terms of the lease, negotiated by JLL’s Chad Urie, Tony Russell and Tim Olson. The property’s owners, McCarthy Cook & Co. and AllianceBernstein LP, recently completed a $38 million renovation of the two-building, 213,000-square-foot campus. Improvements included a new five-story parking structure and two-story, glass-enclosed lobbies, with a new café, tenant lounge and fitness center. New York-based Verizon (NYSE: VZ) ranked at No. 15 on the 2015 Fortune 500 list of the largest U.S. companies, published recently by Fortune magazine. 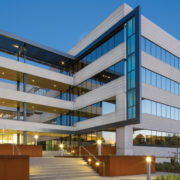 According to CoStar Group, El Segundo-based McCarthy Cook and the New York office of Londonbased AllianceBernstein acquired the two-building Sorrento Mesa campus in 2013 for $33.5 million. The office buildings were constructed on 6.26 acres in 1986. JLL brokers said the property is currently more than 50 percent pre-leased. Repositioning and renovations continue to outpace new construction starts for office space in San Diego. CREW San Diego members and guests experienced firsthand Sorrento Mesa’s largest office technology property renovation to date, Enclave Sorrento, when CREW hosted an educational forum and tour at the newly completed campus, 9808 and 9868 Scranton Road. Enclave Sorrento is a perfect example of aging office space being repurposed to meet the wants and needs of today’s companies and employees. Brian Harnetiaux, vice president of asset management at McCarthy Cook, which owns the campus, said his company had been interested in the property for two years, in part due to its “phenomenal” location in one of San Diego’s technology cluster hot spots. However, the project didn’t come without challenges. One of the greatest challenges of the building was its limited parking, which McCarthy Cook solved by adding a five-story parking structure. Another issue, said Mary Bubacz of DPR Construction, general contractor for the project, was that one of the two buildings on the campus was occupied at the time construction started. McCarthy Cook worked to accommodate the tenant during the 10-month construction window, including catering lunches for them. Charged with creating a design to completely transforming the outdated property, Darrel Fullbright of Gensler, the architect on the project, said that the outdoor spaces and lobbies held the potential to create an extra wow factor. Wanting to approach the project by “doing everything in a slightly different way,” Gensler’s renovations included two-story, glass-enclosed lobbies, new hotel-grade restrooms, a café and tenant lounge with a foldaway glass wall system, large screen televisions and a fitness and yoga center with locker rooms. In all, the campus makeover cost $38 million. With extremely limited developable land in urban business areas and rents in most submarkets not supporting the cost of new construction, repurposing existing buildings is a common-sense trend that is taking the San Diego region by storm. In downtown San Diego, where several buildings are considered “aging,” many redo projects. For example, said Bess Wakeman, executive vice president of JLL, when the former downtown Central Library building on E Street is repurposed, it “will be pivotal in attracting the universities, start-up companies, life sciences firms and nonprofits who have all expressed an interest in the location.” The city of San Diego is collecting responses to its Request for Ideas as to what to do with the site. “We chose Enclave Sorrento as the venue for an educational program to highlight the early collaboration of all of the team members to successfully repurpose this unique and outdated property,” said Allison Simpson, director of business development and a long-time CREW San Diego volunteer. An important aspect from an owner’s point of view of repurposing is the ability to command higher rents. Before it was transformed, Enclave Sorrento was considered a Class B real estate asset with rents at about $1.50 per square foot, much less than the $2.60 average asking rent for all asset classes in Sorrento Mesa, as reported by JLL for the first quarter of 2015. Chad Urie, executive vice president with JLL, the marketing firm for Enclave Sorrento, said amenities are also an important aspect in the repositioning of a property. With a theme of “connected living,” tenants at Enclave Sorrento will have access to a shuttle service from the Coaster and a free shared bicycle program to get to the retail and restaurants nearby. Connected living is also a nod to the outdoor bridges that connect each floor of the two, four-story buildings. The bridges, which are paved with turf, are wide enough to accommodate outdoor furniture. With 213,000 square feet of space, more than one-half of the campus is already leased to a Fortune 20 company, soon to be announced. Interestingly, the company is not taking one complete building. Urie, who brokered the lease deal, said the company was attracted to the connectivity the bridges give to the building and chose to go horizontal by leasing the first and second floors of each building. The 110,000 square feet the company has secured will consolidate more than 600 employees from three different San Diego locations. Warren is president of TW2 Marketing, which provides public relations services to CREW San Diego. McCarthy Cook and partner AllianceBernstein have completed the renovation of Enclave Sorrento, a two-building office technology property located at 9808 and 9868 Scranton Road in San Diego. The upgrade elevated the property from Class B to Class A. The $38 million renovation included a new, five-story parking structure, two-story glass enclosed lobbies, new hotel-grade restrooms, a café and tenant lounge with a fold-away glass wall system and large screen televisions and a fitness and yoga center with locker rooms. Enclave Sorrento tenants will also have access to a shuttle service from the Coaster and a shared free bicycle program. Gensler provided architectural design for Enclave Sorrento and DPR Construction provided construction services. The property is being marketed by JLL. 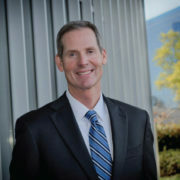 SAN DIEGO—Whether office tenants are seeking high-end class-A corporate campuses or more-affordable class-B space, in San Diego they all seek park-like settings with outdoor workspaces and an amenity-rich environment, head of JLL’s tenant-rep team Steve Holland tells GlobeSt.com. Following the release of the firm’s Q2 office report for the region, we spoke with Holland exclusively about the types of office tenants moving into the area and the impact of Verizon’s lease at Enclave Sorrento on the surrounding office market. GlobeSt.com: What kinds of tenants will we see leasing space in San Diego’s newly constructed office buildings? Holland: For class-A office space, especially in Del Mar Heights and UTC, the types of tenants who will lease these buildings will be professional-services firms, law firms, financial-services companies, real estate companies, accounting firms and healthcare-related companies. For class-B office buildings, you will see technology companies, life-science companies, credit unions, engineering firms, mortgage companies, defense and other more rent-sensitive tenants. Regardless of class-A or –B office buildings, tenants are interested in larger floor plates to foster open and collaborative workplace environments, sustainability features/LEED-certified buildings, amenity-rich environments to attract and retain top talent, plenty of natural light in the workspace, a park-like setting with outdoor work spaces, campus-wide WiFi, an on-site fitness center, on-site upscale dining options, collaboration/gathering areas and indoor/outdoor common areas. They want an amenity-rich campus environment. GlobeSt.com: What kind of rents are they willing to pay in a market with a 13% vacancy rate? Holland: Although the overall office vacancy rate for San Diego County is 13%, the office vacancy rate is in the single digits for the high-quality office submarkets of Del Mar Heights and UTC. For example, Kilroy Realty’s new speculative Del Mar Heights office project—the Heights—will consist of 76,000 square feet of class-A space with an asking lease rate of $4.85 per square foot. In UTC, tenants can expect to pay $4 to $4.50 per square foot for new class-A office space. GlobeSt.com: What impact will Verizon’s lease at Enclave Sorrento have on the surrounding office market and on San Diego’s economy in general? 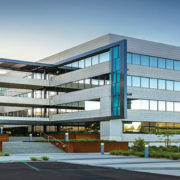 Holland: McCarthy Cook, the developer of Enclave Sorrento, has done an exceptional job revitalizing this two-building office project consisting of 213,000 square feet to create a connected workplace in a booming business district with great amenities and modern design. 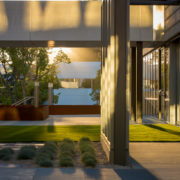 From the inviting new entrances to collaborative outside and inside gathering places, as well as large efficient floor plates with interconnecting bridges, Enclave offer a revitalized energy to Sorrento Mesa’s burgeoning technology community. 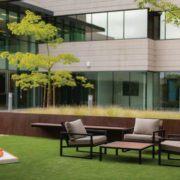 It’s an all-encompassing workplace environment where the Verizon employees can work or work out, collaborate or focus, eat or relax in a connected office technology campus. Verizon’s consolidation from multiple sites to one building is further evidence technology companies are focused and creating workplace environments for their employees that foster collaboration and creativity in an amenity-rich corporate campus. The ability to eliminate redundant shared services will help Verizon lower their occupancy costs and gain greater operational efficiencies. Having Verizon choose Sorrento Mesa for their new San Diego location further validates Sorrento Mesa as the technology hub for San Diego in an environment where the best and brightest workers innovate and create cutting-edge technologies. GlobeSt.com: What else should our readers know about the Q2 report? 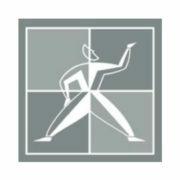 Holland: We’ve had five years of positive net absorption for office space in San Diego, and our unemployment rate has reached the lowest level in seven years. As such, our economy continues to generate solid job growth and demand for office space. In 2015, we should see San Diego add approximately 40,000 jobs. SAN DIEGO, CA—Enclave Sorrento, one of the largest office-technology property renovations in the Sorrento Mesa submarket to date, is a 213,000-square-foot office campus that has recently undergone a $38- million renovation. San Diego-based McCarthy Cook and New York- and London-based AllianceBernstein added upgrades and additions that elevate the two-building, multi-floor, 213,000- square-foot campus at 9808 and 9868 Scranton Rd. here from a class-B property to a class-A one. The renovation included a new, five-story parking structure, two-story glass-enclosed lobbies, new hotel-grade restrooms, a café and tenant lounge with a fold-away glass wall system and large-screen televisions and a fitness and yoga center with locker rooms. Tenants will also have access to a shuttle service from the Coaster and a shared free bicycle program. Gensler provided architectural design for the project, and DPR Construction provided construction services. Cook also says we are in the midst of revolution in workplace design, “much as we now see retailers, restaurants and apartment projects creating inviting and alluring indoor/outdoor experiences that harness the weather and unique elements of the California scene. This trend is gaining momentum and for good reason. Employee costs are typically 10 times the cost of occupancy. A work environment that enhances collaboration, increases productivity and provides on-site amenities adds to productive worktime and can literally pay for itself with a 10% gain in productivity. As GlobeSt.com reported in April, it’s been about seven years since the San Diego market has seen it, but speculative office development is back and more deliveries are expected in 2015. We spoke with Russell exclusively after JLL released its first-quarter 2015 office report to find out his take on office completions, projects under construction and the factors influencing office construction in San Diego.